Brigadier General George Armstrong Custer and his hard riding troopers make their debut in this release. 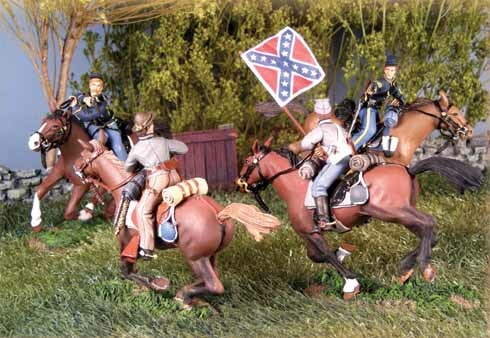 These figures capture the elan of the Union cavalry that was just coming of age at the time of the Gettysburg Campaign. Having repulsed the famous JEB Stuart’s cavalry at East field on the third day of Gettysburg the Union cavalry would go on to raid the Shenandoah Valley in 1864 (the South’s breadbasket) and cross swords with the famous Grey Ghost - John Singleton Mosby and his troopers. Custer ended up being reviled in the Valley for the harsh actions he took, often in response to raids and guerilla actions against his troops and supply lines.